Gravel or shingle provides the most affordable alternative for driveways compared to other surfacing methods like tarmac, concrete, block paving or stunning resin, especially for large or extended driveways. Another advantage is its security aspect – the crunching sound of an approaching visitor or a vehicle instantly alerts you. This is a useful consideration if you live in a secluded area. Gravel driveways are aesthetically pleasing when properly maintained. You can choose from a multitude of stone aggregate, sizes and colours. The ideal size for gravel is 14-20mm. Any smaller and the stone particles might get stuck in vehicle tyres and shoe treads and scatter even more around your property, creating a messy look; any bigger and it will not feel comfortable underfoot, as well as causing a potential trip hazard. Stone driveways can be used as soon as the installation is completed – no drying off time! A gravel driveway is quick to install - for an average-sized driveway (space for 2 vehicles), it generally takes less than a day. First, we do the groundwork preparation to lay the sub-base, which is the most important part of the process. We excavate to a depth of 150mm minimum to remove the topsoil and reduce water retention, but we could dig deeper depending on ground type. Next, we lay a geo-membrane to minimise weed growth, prevent the sub-base layer mixing with the ground below and allow permeability. We lay the sub-base material onto it, which is a mix of crushed stone aggregate and dust (Type 1 or 3) and compact it into thin layers with a vibrating roller of a whacker plate. The final stage is the actual laying of gravel or shingle, which is the finished surface that will be visible. We lay the gravel to an ideal depth of 50mm to prevent your feet sinking into the gravel when you walk onto it. As a last touch, we level the gravel or shingle with rakes and shovels. We recommend that you regularly level the gravel to prevent bald patches and keep your gravel driveway looking pristine. Is gravel or shingle the best solution for your driveway? Our experienced surveyors will help you choose the most suitable solution for your project. Contact us today to arrange a free, no obligation quote! 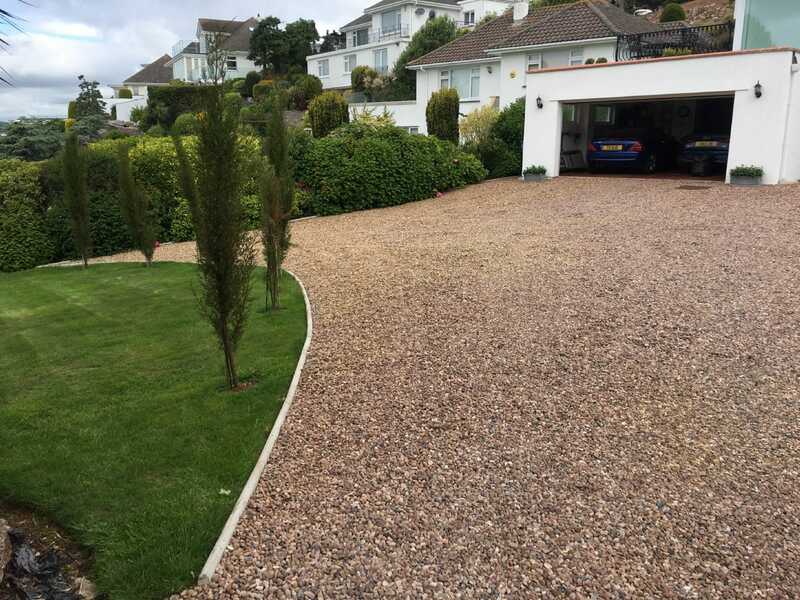 We install gravel driveways throughout Devon, Cornwall, Somerset and Dorset.